However, she's hooked up with Jasper, right? Ew! She doesn't have much taste. Alice, the classmates, and the dad were all likable on some level to me. That's what really surprised me about the first movie because I expected it to be a bonafide Bad Movie. For the kids, I thought they were goofy but self-aware enough to pull off being likable and real (rather than being the typical cardboard sugar Disney Channel teens). I think Compound summed up the dad perfectly. And I'm with denby on Ashley Green. Not sure if she's the only supernatural character I like just cuz I fancy her or if she's actually a decent character. Alice was okay--she's certainly more likeable than Edward or Bella--but I thought she was annoyingly perky. Victoria. Because she's trying to kill Bella and that's cool by me. And she's gorgeous, especially with her red hair. Rawr. Alice was the only person in the movie I wouldn't vomit on if I met her in real life. The others I would throw a bomb at and run away from. But even she has that horrible clothes sense and ugly haircut. There is, in other words, nothing redeeming about this movie. But nice try. I find Bella to be a completely repulsive character. On screen, she comes off as detached, uncharismatic, and manically depressed. That her "friends" try throughout the movie to consistently and aggressively include her in anything when it's obvious she doesn't give a crap about being around them is sloppy story telling. That her Dad doesn't get her some psychiatric help is even messier. That she would appeal to any guy is just...beyond logic. Unless it's just normal for Bella to be the moody, selfish little twit she is. In which case sitting in front of a window for months and screaming and writhing in bed might be typical. 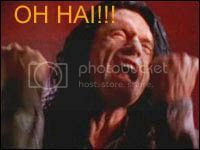 Stephanie Meyer and Tommy Wiseau seem to be operating on the exact same frequency when it comes to understanding human behavior. I was actually thinking about how horrible Bella is during this movie. I couldn't help think why she is screaming in her sleep over an emo guy, and the only way she is healed is through ANOTHER boyfriend? That's what we call codependency. Terrible message to be sending to fragile 13 year old girls. I agree with Mr. Denby that Spoony nailed Bella in his review of the movie. I heard his review before ever seeing the movie(and only with the rifftrax). It didn't spoil the movie whatsoever. It is extraordinary how she is supposed to be even a sympathetic character never mind she's the "heroine."